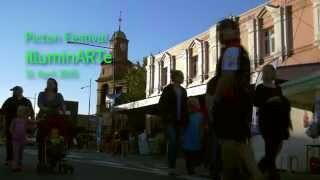 IlluminARTe Wollondilly is a creative arts festival held in the quaint town on Picton. With something for all ages, spectators can expect a remarkable cultural experience combined with breathtaking performing arts, local music, market stalls and food vendors. As night falls, the free family event encourages visitors, locals, friends and families to stroll through the picturesque town of Picton taking in the enchanted ambiance as an amazing range of local artworks are projected onto landmark buildings to illuminate the historic town. In the days leading up to the event, local artists hold a three day Art Exhibition in the Picton Shire Hall which showcases the rich talent of the area. As the town is glowing in illuminations, children and adults proudly march in the Lantern Parade with paper lanterns they have made in workshops captivating the audience with their creations. The finale is a fireworks spectacular over the historic town capping off a night of colour, light and creativity. 110 market stalls include locally made arts and craft, designer fashion and accessories, packaged gourmet foods and wine, while take-away food vendors focus on traditional street food freshly prepared on site.